The S155 sample cell is based on an advanced dual-volume, contact volume design, and offer a number of high-performance advantages over other commercial cell designs. Some sample cells show marked signal variation across their movement range. The dual-volume design of the former M50/M50A sample cells and the new S155 sample cell, however, ensures that the ablation plume is subjected to the same gas flow regardless of the physical location within the cell. 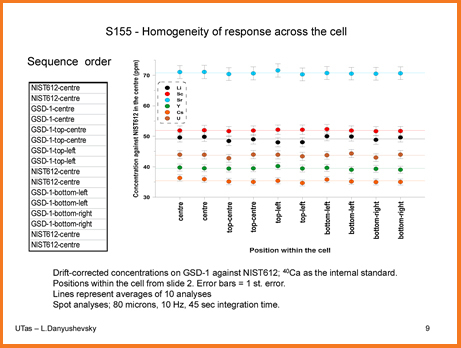 The published results shown here highlight the total lack of variation between the four corners of the cell. For line scanning and mapping, it is important that the scan direction does not affect the signal sensitivity. Both the M50 and S155 have been carefully designed to avoid any interference between the stage movement and the collection efficiency. Furthermore, stages and software control have been rigorously tested to ensure zero stage hesitation at waypoints or corners. 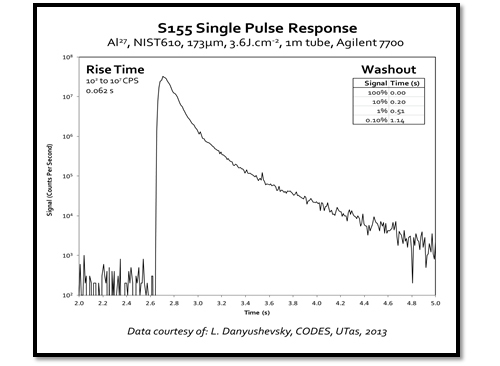 For line scans, mapping, and depth profiling, fast washout times are essential. For point analysis, a fast washout time can allow faster throughput, better identification of sample heterogeneity (nuggets, inclusions, etc. ), and shorter analysis times. The washout time is determined by timing how long it takes signals to reduce to background levels.